Her family had no idea how Aileen felt or who she was. Did it even occur to them to wonder? Did they care? To them, she was the cook, the nagger, the worrier, the chauffeur, the nurse, the laundress, the accountant. They didn't realize she'd been at the top of her class, a champion camogie player. That she lived and breathed and felt just like them. That they were a part of her and she of them. Always. Always. Kate mimicked Colleen's movements, but the thread tangled almost immediately. "Do you have a book I can study?" "A book? Heavens, no. We learned from our grandmothers, and they from theirs. 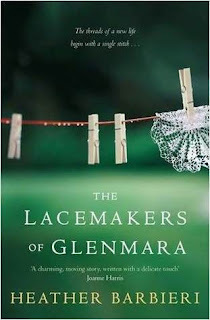 It's a skill handed down, you see, from the days the wealthy Irish ladies brought the methods home from Europe and opened the lace schools, to help the people during the Famine, our ancestors too, making the lace to keep themselves alive," Colleen said. "You learn from watching and doing. Don't worry about making mistakes. you can always start over again." "Padraig loves you. Anyone can see that," Bernie said. Kate stared at the flames. "The voice sounded so real." "The living are close to the dead there," Bernie replied. "It's one of the thin places, where the past and present touch." Maybe you'll find yourself on a deserted lane and a man driving a colorful cart will offer you a ride and bring you to a village where the land runs down to the sea, a place where everything is waiting to begin. It doesn't have to be perfect. you don't have to be perfect. All you have to do is be. You'll take up the same needle and thread and see that they're magic, or could be--if only you let them, if you try--that the women, who gossip like sparrows and bite like midges and laugh so hard they cry, will teach you something new and you will teach them too, and it won't be all bitterness, not all, no, and the man walking up the road to see you is someone you could spend time with, make a life with, if you take a chance. These quotes are wonderful. I can't wait to read this book, it sounds great.